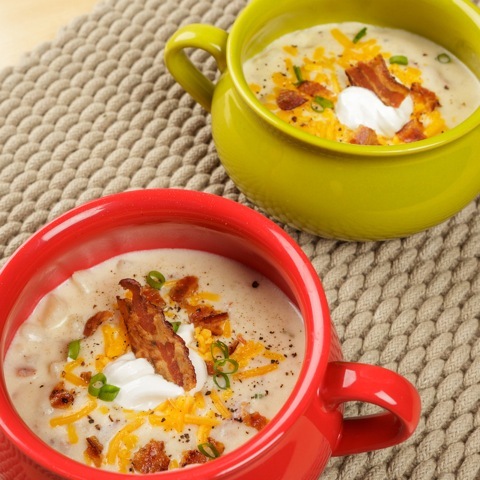 A restaurant favorite, this soup is easy to make at home with Carolina Pride bacon, russet potatoes and cheddar cheese. Heat a large skillet over medium-high heat. Add bacon and cook until brown and crispy, about 6-8 minutes. Transfer to a paper towel-lined plate; set aside. Melt butter in a large stockpot or Dutch oven over medium heat. Whisk in flour until lightly browned, about 1 minute. Gradually whisk in milk and cook, whisking constantly until slightly thickened, about 1-2 minutes. Stir in potatoes and green onions. Bring to a boil; reduce heat and simmer until potatoes are tender, about 10-15 minutes. Stir in bacon, cheese, sour cream, and salt and pepper to taste. If the soup is too thick, add more milk as needed until desired consistency is reached. 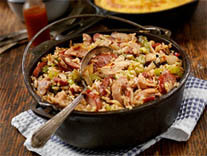 Serve immediately, garnished with green onion, cheese and bacon, if desired.